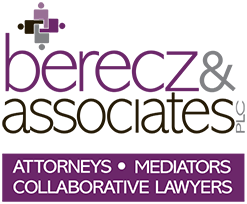 If you do not choose to use mediation or collaborative process, your divorce case will proceed through the traditional litigation system. This will include several steps. The process begins with filing Complaint for Divorce documents with the court. These provide the judge and the Friend of the Court with information about you, your spouse, and your children, and let the court know your wishes about parenting time, child custody and support, spousal support, and the division of property and debt. In Michigan, there is a mandatory waiting period before a divorce can be finalized. If you and your spouse have no minor children together, you must wait 60 days. If you have minor children together, you must wait six months. The waiting period begins when the Complaint for Divorce is filled. Sometimes a temporary order is needed to determine how issues will be handled during the waiting period. These issues can include parenting time, child custody and support, spousal support, payment of bills, who lives in the marital home, among other matters. If a temporary order is needed, a Motion/Request for Temporary Order can be filed with the complaint documents. Mediation or a conference with the Friend of the Court may be required in an attempt to resolve these temporary issues before going to court. If you and your partner cannot agree on temporary arrangements, a judge or referee will make a decision on the requests. After the initial paperwork is filed and temporary issues are resolved, the discovery process begins. Discovery gathers documentation about each spouse’s income, debts, and assets, among other things. This allows you to make informed decisions during settlement negotiations, and provides information to be presented at the trial. Discovery may include a set of written interrogatories you or your partner must answer under oath. Subpoenas can be sent to employers, financial institutions, and others requiring them to provide documents. Discovery may also include taking your partner’s or other people’s depositions. In the majority of cases, you and your partner will agree, or the court will order you to attend mediation with a neutral third party (the mediator) to resolve outstanding issues. Your lawyer may or may not need to attend the mediation session with you. The court will also require you both to attend a settlement conference at the courthouse if resolution has not been reached. At the conference, you will meet with your spouse and both attorneys to discuss settlement options. The judge will provide his or her perspective on the outstanding issues. Participating in a trial is one of the biggest fears people have when going through a divorce. However, we have handled numerous trials and will assist you at every step along the way. Further, in Michigan, statistics show that only 2% of cases go to trial. The rest settle before the final hearing date. At the trial, you and your spouse, and any witnesses called, will take the stand and respond to questions from attorneys for both sides. Based upon the testimony and other evidence, the judge will decide disputed issues. The judge may take several weeks before issuing a ruling. Spousal support — Spousal support, or alimony, is money paid by one spouse to the other for that spouse’s support. The court looks at several factors when deciding whether or not to grant a spousal support award, and if so, how much and for how long. Property — The court will attempt to reach an equitable and fair division of the marital property and debts. While taking into account several factors to determine fair division, in Michigan each party usually receives half of the value of the marital assets and assumes half of the marital debt. While no longer necessary to obtain a divorce, the presence of “fault” can be considered and may justify a disproportionate division under some circumstances. Parenting time – Decisions will be made about when children will be with dad and when they will be with mom. There are many ways to structure parenting time to take into account children’s activities and schedules, parent availability, and other factors. Frequently, parents will alternate weekends. That means grappling with the week. Starting with a simple calendar can help clarify what works best for your children and you, and serve as a starting point for discussion. Legal custody — This determines who will have decision-making responsibility in important life decisions affecting your child, such as schooling and medical care. Generally the court wants both parents to be involved in these decisions and favors joint legal custody. Physical custody — This sets forth with whom the children live the majority of the time. Physical custody may be joint when both parents have appreciable parenting time with the children; it does not have to be equal. Sole physical custody is appropriate if one parent is absent or exercises substantially less time with the children than the other parent. Determining custody and parenting time — In Michigan, “the best interest of the child” is used to determining custody and parenting time. The Court will examine several factors to determine what is in the best interest of the child. We can discuss these items with you as they relate to your individual situation. Child support – The court will use Michigan Child Support Guidelines to determine child support awards. The formula is based on the parents’ incomes and the number of overnights the child spends with each parent to determine the amount of support. We have software to run the guidelines and will discuss with you the range of child support you are likely to pay or receive. This process can be overwhelming and intimidating, but we can help alleviate your anxiety and protect your interests. Our office offers different levels of representation based on your needs. We can represent you as your attorney of record in your divorce case. This means that we would handle all court appearances and process all paperwork throughout the divorce. We can be retained as a consulting attorney. In this role, we will guide you through the process, but you are formally representing yourself. We will tell you what paperwork needs to be filed when, and answer procedural questions you may have. We will also advise you on how the law applies to your case. We can counsel you through the mediation process, advising you of what to expect, and developing a settlement proposal that fits your needs. You can consult with us following mediation or in between sessions about any questions you may have. If you are able to reach a full agreement with your spouse and do not need the aid of an attorney to negotiate that agreement, you can retain us simply to draft the paperwork necessary to complete your divorce based on the agreed upon terms. A lawyer may only represent one spouse in a divorce and is ethically precluded from representing you both. For more information regarding our representation or the divorce process, please contact us to schedule an appointment.